Dirk Kuyt has spoken of his determination to regain a regular place in the Liverpool team.-The 31-year-old has been one of the first names on the teamsheet in recent years but has started just half of our games so far in 2011-12. He accepts this is an inevitable consequence of Kenny Dalglish building a squad fit to regain Champions League football - and insists he'll do everything he can to force the manager's hand. "From childhood, I've always been disappointed when I'm not in the team because I'm desperate to be involved and make a good contribution," said Kuyt, whose Liverpool CV reads 67 goals in 247 games. "But it also makes me very determined too. I need to continue to prove myself, train as hard as possible and, when I do play, make sure my performance is of a high standard." The 80-time Holland international was brought to Anfield on the back of successive trophy-winning seasons in 2006. Much has changed in L4 since then but Kuyt - who was our top scorer last year with 15 goals - thinks the club is now back on track after a difficult period. He added: "Competition is tough now but it's brilliant for the club that there are so many players to choose from now, top-class international players. The players realise at the end of the day you need more than 11 good players to be successful. "When I first arrived here we had a very good, big squad but for the last two seasons before this one, we haven't had the depth that we did in the first three seasons. "Someone like Craig Bellamy is a strong addition to what is already a very strong squad, and that can only be good for the team. We definitely have better quality now and more players to choose from as well. "I think with the signings we've made, we have a great squad now so we should be ambitious and have confidence in ourselves." 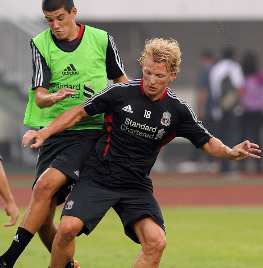 0 Komentar untuk "Dirk Kuyt on his starting battle"